Photo By Dexter K. Oliver: Pictured is Diesel, one of the horses allowed to die from dehydration. Oliver has taken issue with an editorial written by Mike Bibb about his article regarding the deaths. It seems alternative facts have traveled west from Washington, D.C. to Graham/Greenlee counties. Kellyanne Conway, counselor to President Trump and ardent supporter of such twisting of the truth, has nothing on local editorialist Mike Bibb. Mr. Bibb used a recent article of mine, “A Travesty of Justice”, on this website to further his own agenda pertaining to the incompetency of the Forest Service. In doing so, he showed his lack of interest in the truth. 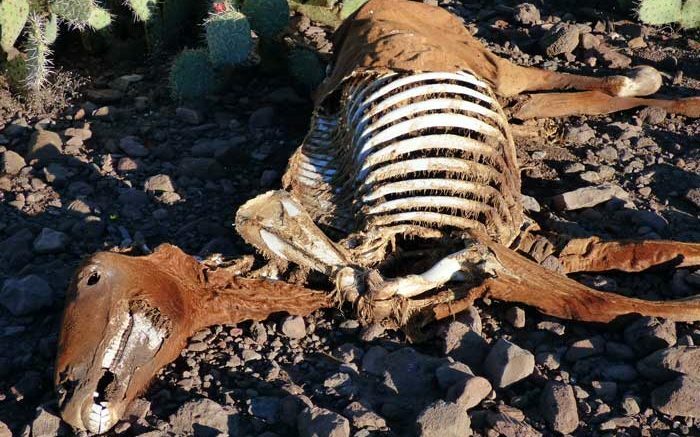 He quotes me as writing that the “USFS petitioned to have the case (two dead horses and one mule) removed…” from the Greenlee court to the federal court in Tucson. This is blatantly false and anyone reading my article closely would see that. As I wrote, one of the range staff hired a Tucson lawyer who made the motion of removal. Mr. Bibb then conjures up a federal judge from the recesses of his own mind, not my article, although he certainly alludes to it, to continue his fiery prose and somehow tie this in with current conflagration in the Pinaleño Mountains south of Safford. He took my mention of the Supremacy Clause of the U.S. Constitution and insinuated that it was the main cause for alarm about federal shenanigans. In reality, the pertinent facts in my article dealt with a rank-and-file Forest Service employee impersonating a federal law enforcement officer, on paper in court documents, to escape from being prosecuted for nine counts of animal cruelty. In other words, a class 6 felony under Arizona statutes took place to avoid nine misdemeanors, and so far nobody in the legal system has had the integrity to rectify the situation. I think “alternative facts” are best left to the pros in Washington, such distortions have no place here in southeastern Arizona.